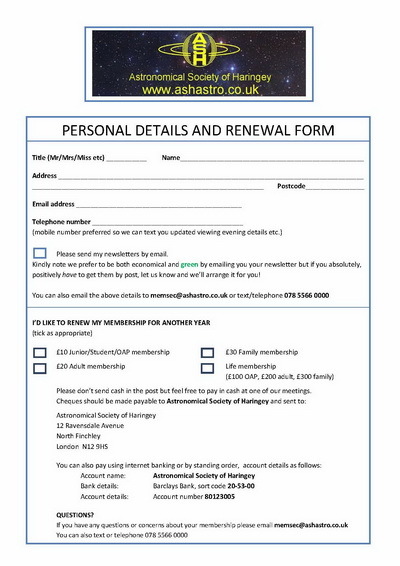 We have in our membership a wide range of astronomical interests and abilities. Besides our regular observing meetings we endeavour to arrange talks and activities that can include all our membership. Later of course Arthur was knighted, giving the Society two related links - not only with 'The Night Sky', but with 'Knights of the Realm'. 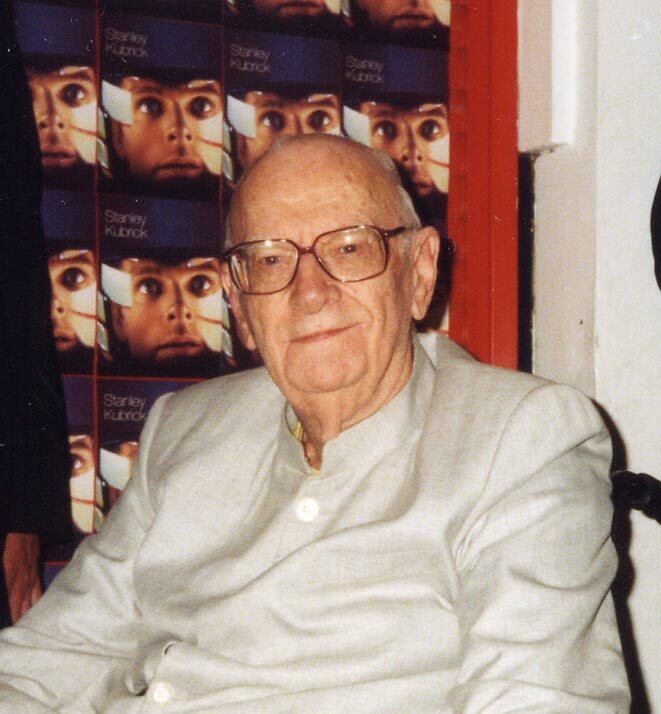 Above: John Bush - then Managing Director at Gollanz Books, publisher of Arthur C. Clarke's novels - was one of the speakers at early ASH meetings. 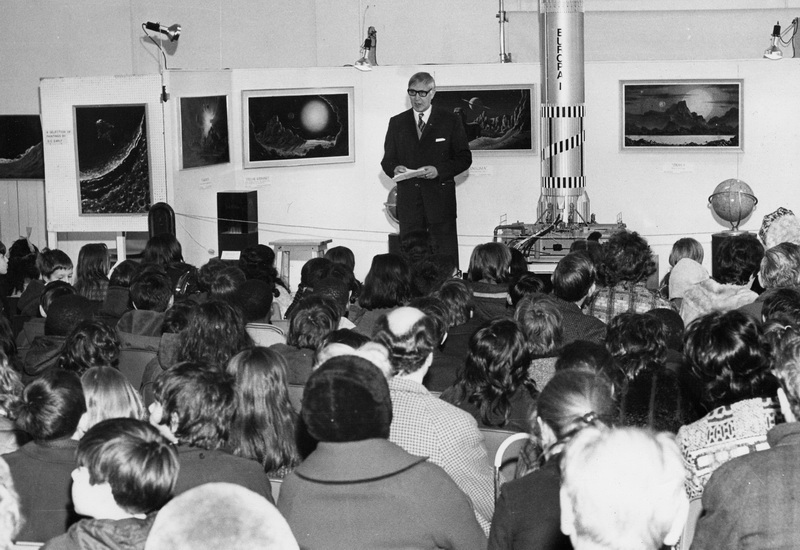 Here the first Space Age Exhibition is still set up in the Wood Green Arts Centre, including a background of original artwork by David A. Hardy and a 1:10 scale model of the European launch rocket, Europa, on the stage. At the outset it was decided that the interests of the ASH would be as wide as possible, reflecting that of our Patron. It should encompass space research, astronautics, cosmology, science fiction and fantasy, as well as astronomy, plus all associated technologies. 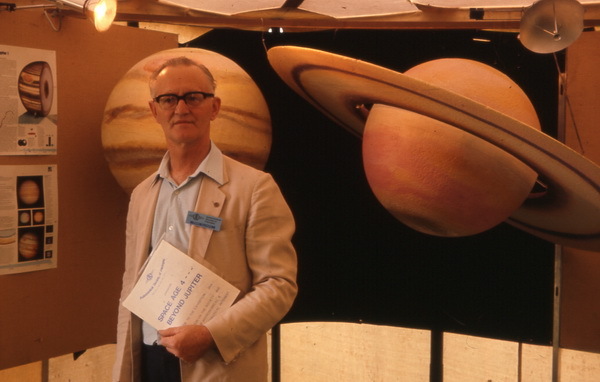 Having grown out of the first Space Age Exhibition, other exhibitions were organised by the Society, many of which were based at Alexandra Palace. The ASH initially met in various rooms at Alexandra Palace, both before and after the fire in 1980. Plans were well-established to make a permanent base there, using the empty North-West Tower as the Headquarters, with an observatory on the roof, possibly a planetarium, which would have been the start of grander plans for setting up an astronomical and space education centre, of which the ASH was to be a part, all adding to the facilities the Palace could offer to the public. Much work was done, including building on the roof to hold a 17 foot dome. In fact the dome was in place, and just about to be bolted down, when high winds of January 1991 got under the dome, lifted it off and deposited it in the courtyard below, damaging it beyond repair. This time also coincided with changes to the management structure, which meant the proposed Educational Centre was not viable, and we had to find alternative accommodation. Firstly meetings were held at White Hart School, and in recent years came a move to a different borough as we now meet at Ashmole School, Southgate, London N14, although the ASH name remains! Meetings are held monthly, usually on the third Thursday of the month. Members are kept informed of Society news and wider issues through our long-running magazine, '2002'. Click logo for the page, where there are links to downloadable versions in PDF format. The Society also has its own Facebook page. Click logo for page.